I am very new to JetBrains MPS and I'm having trouble with the constraints definition. Concept "Component" with children "Port[0..n]"
A concept "Instance" which references to a single "Component" and which has a children collection of "PortReferences". These "PortReferences" shall be allowed to point only to those "Ports" that are children of the referenced "Component"
It is possible to reference to ports, which are not children of the respective Component. I would appreciate for any help. Thank you in advance. But let me give it a try: The inherited scope delegates scope resolution to the next ancestor, which implements ScopeProvider. This means for the present case: (PortReference ->) Port -> Component -> ComponentReference -> Instance (implementing ScopeProvider). Is that right, so far? 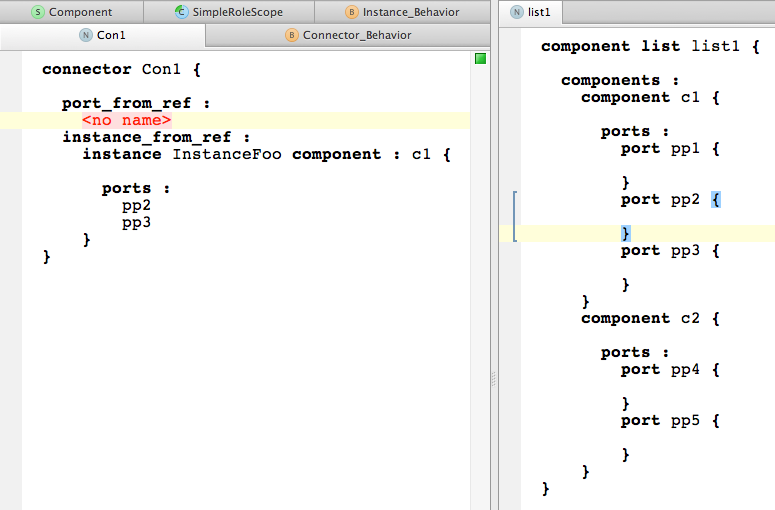 Then, the getScope() method will be invoked. The SimpleRoleScope() method helps building own custom scopes. The method looks at the referenced Component (this.component_ref) und provides the ports connected to this Component (link/Component : ports/), right? But what does the getName method here? What is meant with child? You are right with your reasoning about scope resolution - the inherited scope investigates all ancestors implementing ScopeProvider in the AST up to the root node. In Java, for example, searching for a target of a variable reference in a method would go first to the method's body searching for local variables, then to method declaration searching among parameters, then the surrounding class searching for fields. In our case, the search is much shorter, PortReferences are children of Instances, so the wrapping Instance is asked first. Since it returns a non-null scope, the search does not continue further up the AST. Scopes in MPS need to be able to filter out candidates (Ports in our case) by string values, thus they need to have an implementation of the getName() method, that returns a string representing each node in scope. We use the Port's name as a natural representation of Ports. The "child" parameter of the method in our case is a Port that is in the scope. port_from_ref shall be able to point only to a port of the instance "instance_from_ref". Nevertheless, the method returns all Ports of the instances... Any ideas what went wrong? The PortReferences will still be looking for Ports, thus kind must be "Port". So we can take all ports from the component of the instance. Great that Vaclav replied so quickly and thoroughly. If you need some extra help, I can help via e.g. a Skype call with screen sharing, etc. (I like to spread the MPS goodness). Just let me know if you get stuck. First, thank you very much again, Vaclav. But I'm sorry, still the referred ports from ALL existing instances are returned. It's the second thing you mentioned: I need to return only the ports referred to the ONE instance (instance_from_ref). So its something like a reference to one of the references linked to the ports. Just to be sure I'm on the right track, can you please check that the attached images show the intended behavior? If the instance refers to two ports of a component, only these two ports should be available in the connector. Other than that, I think it would help if I could have a look at the project. Is there a chance you could share it? Yeah, this is almost the thing I'm looking for. Then I define (several) connectors, which "connect" these instances: Here I want to select an instance (instance_from_ref) and for "port_from_ref" only the chosen ports shall appear. So in difference to your example, I first define several instances BEFORE I define the connectors. Is that understandable? But I can share my project, of course. It's defined at references, so instance_from_ref links to an Instance... or am I wrong? All right, that explains a lot. Sorry for not noticing this earlier. Your "port_from_ref:PortReference" definition must be a child of Connector, not a reference. Thanks a lot! Sometimes it's so easy ... "facepalm"
To distinguish the role of the child that you are setting, you need to modify the getScope() method slightly and implement the second getScope() method, as well. In the first method we're now checking the child of Connector that raised the request for scope of "Port". The "come from" construct can be used to query the asking child. 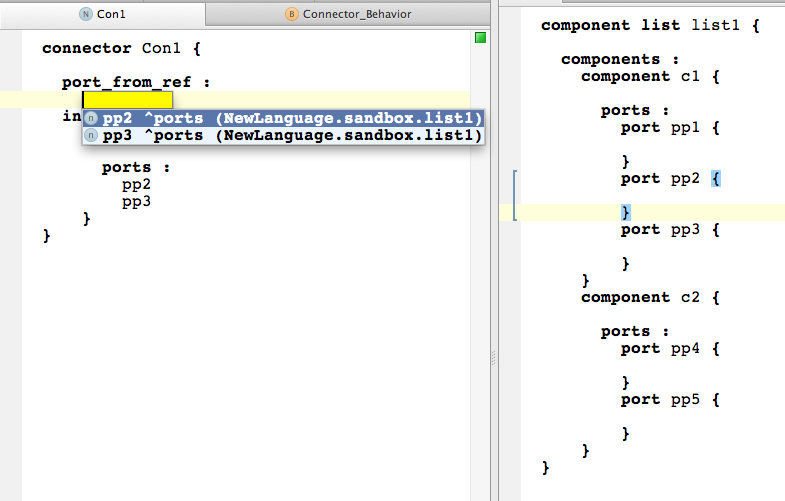 The ComeFromExpression concept is in jetbrains.mps.lamg.scopes language, which you may need to import (Control + L). In the second method we're handling the situation when the child that is being completed is null, so we can decide based on its desired role in the parent. Note: The code is just a quick draft so it may need some polish. You could perhaps call the second getScope() from the first one, passing in the role retrieved through the "containingRole" concept - e.g.